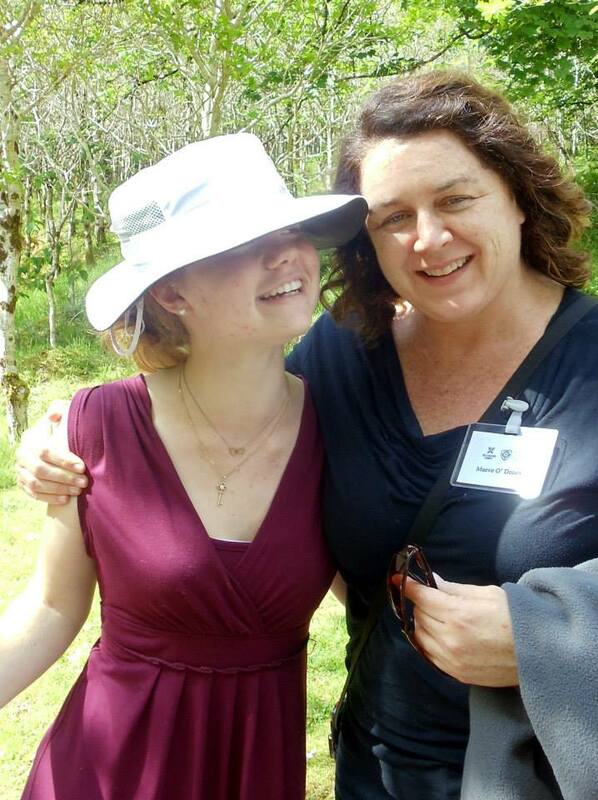 Jennifer Ashwell with Philosophy Department Chair Maeve O’Donovan in Ireland during a study abroad trip. Expectations can mirror reality, but because often they are pure fantasy I find it best to keep my heart muscle flexible. Before joining my school’s short-term study abroad trip to Ireland, I quickly associated the entire country with St. Patrick’s Day in the United States. Within seconds it would be March, 17th, and I would be sporting a green t-shirt, a shamrock-laden ribbon in my hair, and a “Kiss me I’m Irish!” button. I had expected Ireland to be the land of the greenest-greens, Guinness pints, four-leaf clovers and hospitality. Of my two-week long stay at Kylemore Abbey, I had imagined the furnishings, accommodations, and space of Cinderella’s castle. I would wake early to a sunrise over mountains and mosey over to a studio to try yoga. The first noticeable difference between my expectations and reality was the weather. In my mental map, Ireland was always rainy. In Connemara, from June 2nd to the 12th, it was sunny and warm. The day it did rain, it was not dreary. The landscapes stayed brilliant. On arrival, I lugged my suitcase up a mountainous hill and many stairs to find that I did not have a suite, but a small space, and that I was separated from fellow travelers only by wooden partitions. The Abbey had hosted a prestigious girls’ school for decades, but recently closed it due to financial difficulties. To use the location in a special and profitable way, the nuns in charge hope to run a summer institute, which is why they welcomed my school. Accommodating us was no easy task, and in thinking about the trip I had forgot about all the work that goes into caring for 28 people. Some of our hosts awoke early each day to fix breakfast and stayed late to clean up after dinner. Our trip coordinator in Ireland, Geraldine Mills, commuted from her home to the Abbey, from the Abbey to her home, and back again. For our daily discussions, Mother Maura, the leader of the Benedictine nuns, turned on a space heater, so we would be comfortable, even though energy costs two arms and four legs in Ireland. The Abbey looks like a palace, but the richness of my trip did not belong to king size beds, grand staircases, or Jacuzzi tubs. When I tell people about Ireland and Kylemore Abbey, I talk not of the color green, nor of Guinness pints. I tell them of how much fun I had ‘hoovering’ the floors after dinner with a vacuum named Henry and a new friend named Mike, of a serendipitous lunch with Ms. Geraldine, of the bat that caused panic by flying around our living areas at night, and of the peace I felt when strolling the grounds in silence. The richness of my trip belongs to the warm, welcoming nature of the people I was able to get to know. As anticipated, I found hospitality in Ireland. However, most of my trip was a lot grander than anything I had expected.